You don't think a modern auto manufacturer has an incentive to make a long lasting reliable car? How about long term customer brand loyalty??? No, I really do not. Auto manufacturers are counting on and very much encouraging leasing and changing cars in the 2-5 year period. Cars are designed nowadays to be as good as they can be during the warranty period. There is not a single manufacturer, including Bentley and Rolls-Royce, that designs something with the explicit plan to make something last much past the warranty period. They want their customers to be very happy and loyal, but if the car lasts "forever", they have no real motivation to buy a new one!! Mercedes was in pretty bad shape financially in the mid and late 90s. Their cars, while not perfect, would last decades. Their customers, tons of them, were still driving 70s and 80s diesel sedans and SL roadsters and the cars just went seemingly forever! Brand Loyalty is warranty period. The new 2019 G will do EVERYTHING better than the 2018 and older, but the appeal of the G is that it is and always has been "raw" and unlike any other SUV. Now....it will be just an über luxury GLS or GLE with the look of the classic G. I am not saying it will not be amazing, but it is just now a Range Rover or more rugged GLS! Mercedes offers CPO warranties up to 5yrs/unlimited miles for free and up to 7yrs/unlimited miles for a fee. That could be well over 100kmi. Steve Dinan has stated that BMW drivetrains are designed for 200kmi, so I would think Mercedes has similar design goals. So you're saying that people lease and upgrade cars frequently because they don't last as long as they used to? People get out of their three year old Mercedes because they're worried about the quality of their vehicle yet they run out and buy another Mercedes? Or, do you think people lease because they want (especially those who can afford a brand like Mercedes) the latest and the greatest every couple of years? I had a brand new 600SL in the late 80's. It was a nightmare and the dealer actually took it back. I just struggle when people call a 2018 G63 "raw". And how can you compare the 2019 G with a GLS or a GLE? Totally different capabilities. 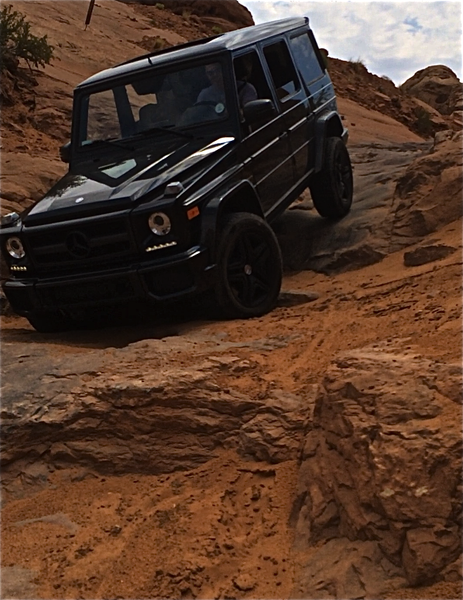 Meet me in Moab with your GLS and I'll show you what I mean. I'll reserve judgement on the 2019 G until I have a chance to spend some time on the road, off-roading, and rock crawling. I applaud Mercedes for manufacturing a vehicle like the G and for modernizing a legend while maintaining it's core competency. @G55K...Never did I ever question the capability of the 2019 G or the Range Rover. I have said over and over!!!! I firmly believe the 2019 G will do EVERYTHING better than the 2018 and older Gs. Also, I have had 3 Full Size Range Rovers and one Sport. They can do basically everything the G can do. They are amazing vehicles! 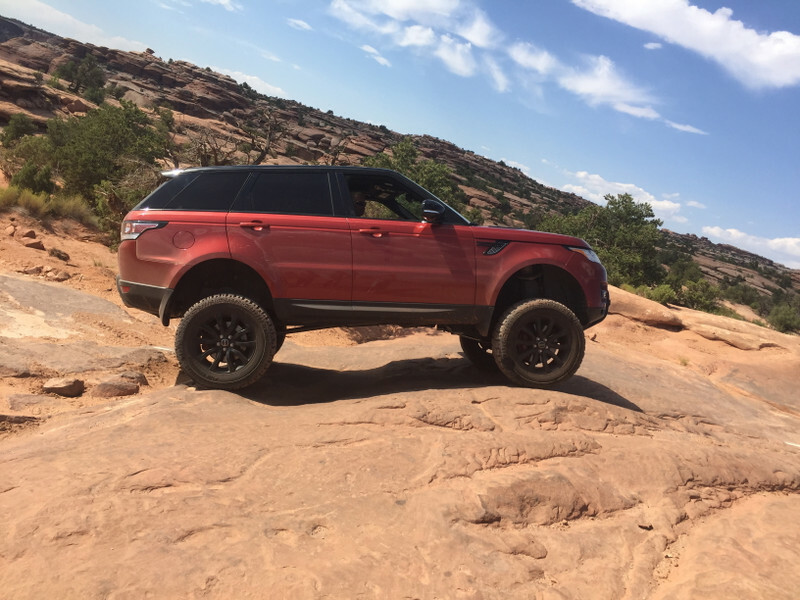 I love my G, but LOVE the Range Rover. I believe (a lot of) people do not keep vehicles long term because they of course want the newest and greatest models, and that newer vehicles are so tech laden, that they will not last. The few times in the last 10-15 years that we have bought and kept, instead of leasing....not a fun adventure paying for repairs, expensive need to be ordered parts and not having the security of warranty. I will not meet you in MOAB with my GLS, since I do not have a GLS. It just comes down to that I really loved that Mercedes has updated the G over the years, but kept it kind of "rough" and yes raw compared to other Mercedes models and every other high end suv. Looking at the interior of the all new 2019 G, while comfortable as it will be....it has become just too luxurious and mainstream. If I wanted an S or E Class sedan, I'd buy one. If I wanted a super comfy suv, I would just get another Range Rover! Last edited by Deutsch100; 08-04-2018 at 01:25 AM. That must be a head turner. I moved to leasing a bunch of years ago decrease the frequency of my car purchases, I just coudn’t staye interested in a car more than a year and a half, so 3 year leases helped to force me extend my automotive turnover time. You and I are one type of customer, but then you have they CPO market which tries to avoid the high depreciation of the first 2-3yrs of ownership, after that you the have 7-10yr+ market which can land an S Class for the cost of a of a new Jetta. I’ve already started looking for an older G as a play car. If I wanted an S or E Class sedan, I'd buy one. If I wanted a super comfy suv, I would just get another Range Rover! The 2020 GLE and GLS will also get this interior, so it is now the corporate Mercedes higher-end interior. Perhaps the new G Class is becoming something that a car buyer expects when they see the Benz star on the grill. Although, if they wanted to make it proper super comfy Benz, a unibody, a simpler AWD system, and better aerodynamics would been a better way to go. 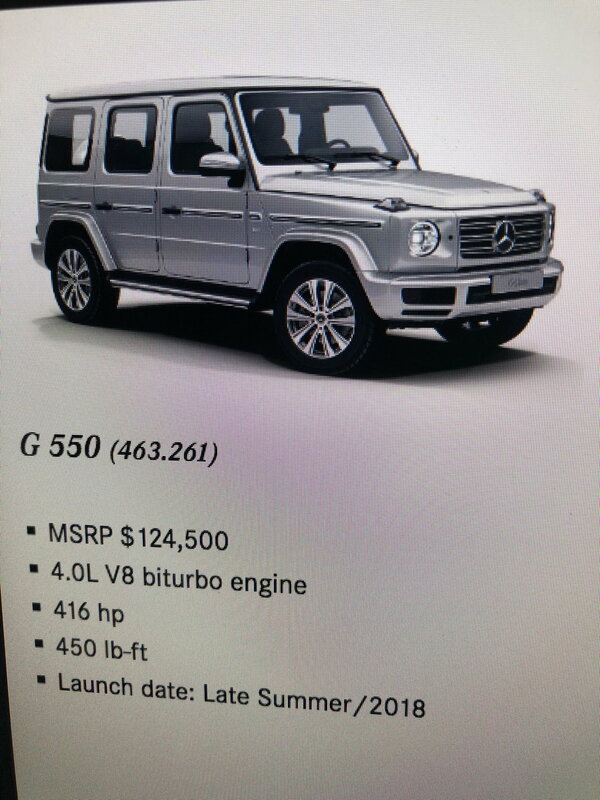 Official price of 2019 g550? But then that changes the "character" of the G. Although old school by current standards, buyers are attracted to these vehicles because they are so unique in design and performance. I'm looking forward to the updated MY19 just because of the suspension changes. Every other change represents an upgrade without diluting the original character of the G.
I thought you would have gotten yours by now. Really looking like Oct at best for 19 G wagons.. Please let me know when you feel comfortable to take a G63 order. I guess you would need to know how many allocations you will have and what the expected delivery schedule would be. do you habe the new dog? Do you have that for the G63? It looks like October is the earliest we will see deliveries in the states. There are a bunch on the ground at the port but need to go through the bureaucratic regulatory process. At least that's what I have been told. I don't believe MBUSA is holding them back.